In a total departure from what usually fills my weekends I've signed up for Sophie Radcliffe's cycle ride from London to Paris in 24hrs next year. There's something about that particular challenge that instantly grabbed me and I've long since learned it's best (and most fulfilling) to just go with whoever in your head is actually at the controls when it comes to stuff like this. I think I'm secretly a big fan of cycling though there's still some mental resistance to going out for a long 50-mile+ ride on my todd when I'd quite cheerfully go and run 30+ miles. Not sure why that is. I am, however, convinced it complements running training very effectively. So when Helena tweeted about a guided c.100km ride down to Brighton a few days back, once more whoever's driving up there instantly decided to take part and I found myself on a train to Richmond (an opportunity missed there I guess!) for the start two mornings later. Anyway, it's Variety, and Variety is the spice of Brighton's end of pier show. My bike isn't the best for this kind of thing. Much like the Earth it has a solid iron core and pretty much its own gravitational pull. But the way I see it - train on this and then when I switch to a road bike in advance of April it's going to pay dividends. Let's see. So 8 of us lead by David Bavin of DirtyWknd set off South with the weather set fair and the promise of beer and chips on the prom as a carrot (not that we wanted vegetables, we quite specifically wanted beer and chips). 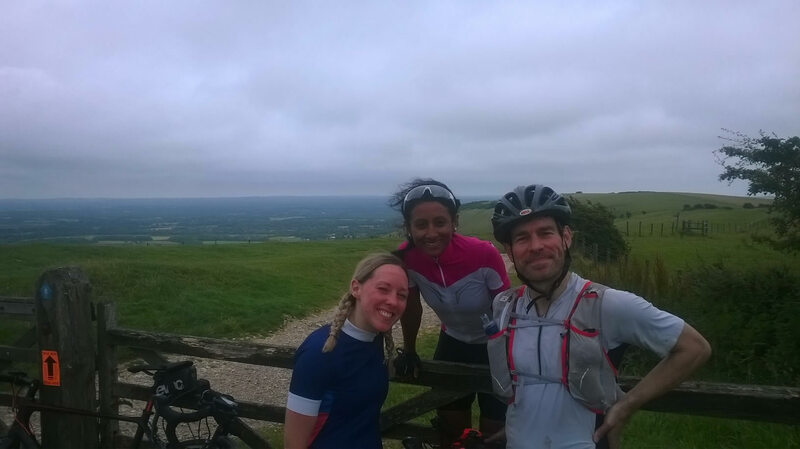 Top of Ditchling Beacon, looking ridiculous. The hills (minor and short as they were) were a struggle at first I will admit, but I was fine after the first couple so that was just rust - I haven't sat on a bike for about 2 years - and I like to think I held my own. As did my knees which I'd also been concerned about given this year's issues and the decimation of the running calendar. Clipping along on a bike is a great way to travel and I loved it. We used minor roads so there were few issues with traffic except once when I dropped my (cheap, luckily) sunglasses and a 4x4 crushed them to atoms. We stopped for cake (runners - we have something in common with cyclists!) about 2/3rds of the way there along with a surreal sighting of Keith Chegwin at some corporate event or whatever (presumably with limited budget). Then after a coffee as hot as the Sun's corona, we headed on as Ditchling Beacon loomed, the only significant obstacle the whole ride. Ditchling is a bit of a sod on a hybrid. I crawled up it, mostly in my lowest gear. I could certainly have run up it a lot faster. Views at the top over the South Downs and the South Downs Way reminded me of the 100 though a totally different context. 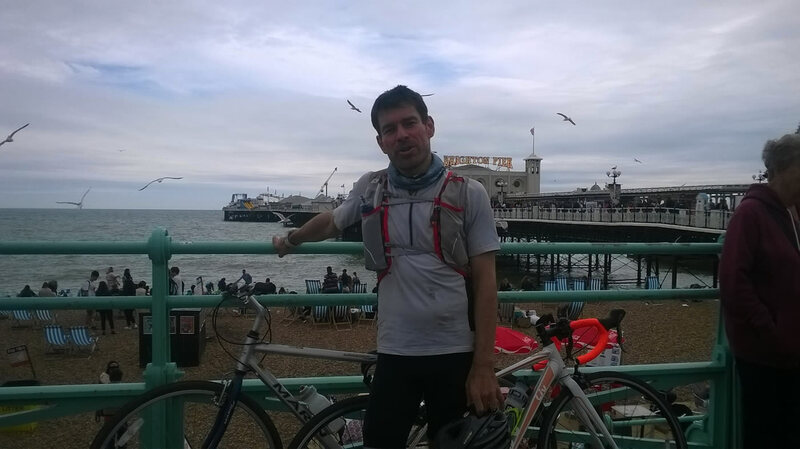 Then there's a long descent into Brighton itself, slower than it might have been thanks to a strong cross-wind. Great fun! I really enjoyed it and I'll be looking out for more of their rides. I've got to got to Leicester in a couple of weeks and the voice in the head is suggesting splitting that into a couple of 60/70 mile days so that looks like it's happening and it'll be interesting to see how it goes over two days.